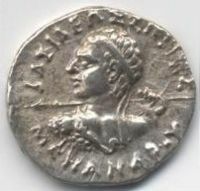 The "Yona" Greek king of India (Menander) (155–135 B.C.E.). inscription in Greek, "BASILEŌS SOTĒROS MENANDROU" lit. "of Saviour King Menander". "Yona" is a Pali word used in ancient India to designate Greek speakers. Its equivalent in Sanskrit is the word "Yavana". "Yona" and "Yavana" are both transliterations of the Greek word for "Ionians" (Homer Iāones, older *Iāwones), who were probably the first Greeks to be known in the East. King Menander and his bodyguard of "500 Yonas" in the Milinda Panha. The description of Greek astrology and Greek terminology in the Yavanajataka ("Sayings of the Yavanas") (150 C.E.). The mention of "Alexandria, the city of the Yonas" in the Mahavamsa, Chapter 29 (fourth century C.E.). Although the association with eastern Greeks seems to have been quite precise and systematic until the beginning of the first century C.E. (as other foreigners had their own descriptor, such as Sakas, Pahlavas, Kambojas etc. ), these terms came to designate more generally "Europeans" and later "foreigners" in the following centuries. Indians - used the word Yavana in the Mahabharata and other historic texts. Sri Lankans - used the word Yona in the Mahavamsa ("Great Chronicle") and other historic texts. In Indian sources, the usage of the words "Yona," "Yauna," "Yonaka," "Yavana" or "Javana," etc. appears repeatedly, and particularly in relation to the Greek kingdoms that neighbored, or sometimes occupied, the Indian north-western territories over a period of several centuries from the fourth century B.C.E. to the first century C.E., such as the Seleucid Empire, the Greco-Bactrian kingdom and the Indo-Greek kingdom. After Alexander's invasion, the Greek settlements had existed in eastern parts of the Achaemenid empire, north-west of India, as neighbors to the Iranian Kambojas. The references to the Yonas in the early Buddhist texts may be related to the same. Buddhist proselytism at the time of king Ashoka (260 B.C.E. - 218 B.C.E.). Some of the better known examples are those of the Edicts of Ashoka (c. 250 B.C.E. ), in which the Buddhist emperor Ashoka refers to the Greek populations under his rule. Rock Edicts V and XIII mention the Yonas (or the Greeks) along with the Kambojas and Gandharas as a subject people forming a frontier region of his empire and attest that he sent envoys to the Greek rulers in the West as far as the Mediterranean, faultlessly naming them one by one. In the Gandhari original of Rock XIII, the Greek kings to the West are associated unambiguously with the term "Yona": Antiochus is referred as "Amtiyoko nama Yona-raja" (lit. "The Greek king by the name of Antiochus"), beyond whom live the four other kings: "param ca tena Atiyokena cature rajani Turamaye nama Amtikini nama Maka nama Alikasudaro nama" (lit. "And beyond Antiochus, four kings by the name of Ptolemy, the name of Antigonos, the name of Magas, the name Alexander"). Other Buddhist texts such as the Dipavamsa and the Sasanavamsa reveal that after the Third Buddhist Council, the elder (thera) Mahárakkhita was sent to the Yona country and he preached Dharma among the Yonas and the Kambojas, and that at the same time the Yona elder (thera) Dharmaraksita was sent to the country of Aparantaka in western India. Ashoka's Rock Edict XIII also pairs the Yonas with the Kambojas (Yonakambojesu) and conveys that the Brahmanas and Sramanas are found everywhere in his empire except in the lands of the Yonas and the Kambojas. The Mahavamsa or "Great Chronicle" of Sri Lanka refers to the thera Mahárakkhita being sent to preach to the Yona country, and also to the Yona thera Dhammarakkhita, who was sent to Aparanta (the "Western Ends"). It also mentions that king Pandukabhaya set aside a part of the city of Anuradhapura for the Yonas. Another Yona thera, Mahádhammarakkhita, is mentioned as having come from Alexandria in the country of the Yonas, to be present at the building of the Ruwanweliseya. Another example is that of the Milinda Panha (Chapter I), where "Yonaka" is used to refer to the great Indo-Greek king Menander (160 B.C.E.–135 B.C.E. ), and to the guard of "five hundred Greeks" that constantly accompanies him. The Vanaparava of Mahabharata contains verses in the form of prophecy complaining that "… Mlechha (barbaric) kings of the Shakas, Yavanas, Kambojas, Bahlikas etc. shall rule the earth (i.e India) un-righteously in Kaliyuga…". This reference apparently alludes to chaotic political scenario following the collapse of Mauryan and Sunga dynasties in northern India and its subsequent occupation by foreign hordes of the Yavanas, Kambojas, Sakas and Pahlavas, etc. There are important references to the warring Mleccha hordes of the Shakas, Yavanas, Kambojas, Pahlavas, etc. in the Bala Kanda of the Valmiki Ramayana. Indologists like Dr. Hemchandra C. Raychadhury, Dr. Bimala Churn Law, Dr. Satya Shrava, and others, see in these verses the clear glimpses of the struggles of the Hindus with the mixed invading hordes of the barbaric Sakas, Yavanas, Kambojas, Pahlavas, etc. from north-west. The time frame for these struggles is second century B.C.E. downwards. Dr. Raychadhury fixes the date of the present version of the Valmiki Ramayana around/after second century C.E. "After having conquered Saketa, the country of the Panchala and the Mathuras, the Yavanas, wicked and valiant, will reach Kusumadhvaja ("The town of the flower-standard," Pataliputra). The thick mud-fortifications at Pataliputra being reached, all the provinces will be in disorder, without doubt. Ultimately, a great battle will follow, with tree-like engines (siege engines)." The Anushasanaparava of Mahabharata affirms that the country of Mathura, the heartland of India, was under the joint military control of the Yavanas and the Kambojas. From the references noted above, it appears certain that the Yavana invasion of Majjhimadesa (Mid India) was jointly carried out by the Yavanas and the Kambojas. The Greek Yavanas were apparently a minority foreigners in India and naturally may have obtained, in this invasion, the military support of their good neighbors, the warlike Kambojas. The evidence from the Mathura Lion Capital inscriptions of Saka great Satrap (Mahakshatrapa) Rajuvula also lends strong credibility to this view. The Mid India invasion was followed by almost two centuries of Yavana rule which in the light of evidence presented above, appears to have been a joint Yavana-Kamboja rule. Several references in Indian literature praise the knowledge of the Yavanas or the Greeks. "The Yavanas, O king, are all-knowing; the Suras are particularly so. The mlecchas are wedded to the creations of their own fancy." They are also credited as the creators of flying machines that are generally called vimanas. The "Brihat-Samhita" of the mathematician Varahamihira says: "The Greeks, though impure, must be honored since they were trained in sciences and therein, excelled others…". Yet another Indian text, the Gargi-Samhita, also similarly compliments the Yavanas saying: "The Yavanas are barbarians yet the science of astronomy originated with them and for this they must be revered like Gods". On the 110 B.C.E. Heliodorus pillar in Vidisha in Central India, the Indo-Greek king Antialcidas, who had sent an ambassador to the court of the Sunga king Bhagabhadra, was also qualified as "Yona." The Mahavamsa also attests to a Yona settlement in Anuradhapura in ancient Sri Lanka, probably contributing to trade between East and West. Buddhist texts like the Sumangala Vilasini class the language of the Yavanas with the Milakkhabhasa (i.e impure language). The Mahabharata groups the Yavanas with the Kambojas and the Chinas and calls them "Mlechchas" (Barbarians). In the Shanti Parava section, the Yavanas are grouped with the Kambojas, Kiratas, Sakas, and the Pahlavas, etc. and are spoken of as living the life of Dasyus (slaves). In another chapter of the same Parava, the Yaunas, Kambojas, Gandharas etc. are spoken of as equal to the "Svapakas" and the "Grddhras." The Udyogaparva of the Mahabharata says that the composite army of the Kambojas, Yavanas and Sakas had participated in the Mahabharata war under the supreme command of Kamboja king Sudakshina. The epic numerously applauds this composite army as being very fierce and wrathful. The Balakanda of Ramayana also groups the Yavanas with the Kambojas, Sakas, Pahlavas, etc. and refers to them as the military allies of sage Vishistha against Vedic king Vishwamitra. The Kishkindha Kanda of Ramayana locates the Sakas, Kambojas, Yavanas and Paradas in the extreme north-west beyond the Himavat (i.e. Hindukush). The Buddhist drama Mudrarakshasa by Visakhadutta as well as the Jaina work, Parisishtaparvan refer to Chandragupta's alliance with Himalayan king Parvatka. This Himalayan alliance gave Chandragupta a powerful composite army made up of the frontier martial tribes of the Shakas, Kambojas, Yavanas, Parasikas, Bahlikas, etc. which he utilized to defeat the Greek successors of Alexander the Great and the Nanda rulers of Magadha, and thus establishing his Mauryan Empire in northern India. The Manusmriti lists the Yavanas with the Kambojas, Sakas, Pahlavas, Paradas, etc. and regards them as degraded Kshatriyas (members of the warrior cast). Anushasanaparava of Mahabharata also views the Yavanas, Kambojas, Shakas, etc. in the same light. Patanjali's Mahabhasya regards the Yavanas and Sakas as anirvasita (pure) Shudras. Gautama-Dharmasutra regards the Yavanas or Greeks as having sprung from Shudra (the lowest caste) females and Kshatriya (warrior caste) males. The Assalayana Sutta of Majjhima Nikaya attests that in Yona and Kamboja nations, there were only two classes of people… Aryas and Dasas… (the masters and slaves), and that the Arya could become Dasa and vice versa. The Vishnu Purana also indicates that the "chatur-varna" or four=class social system was absent in the lands of Kiratas in the East and the Yavanas and Kambojas, etc. in the West. Numerous Puranic literature groups the Yavanas with the Sakas, Kambojas, Pahlavas and Paradas and refers to the peculiar hair styles of these people which were different from those of the Hindus. Ganapatha on Panini attests that it was a practice among the Yavanas and the Kambojas to wear short-cropped hair (Kamboja-mundah Yavana-mundah). Brihat-Katha-Manjari of Kshmendra  informs us that king Vikramaditya had unburdened the sacred earth of the Barbarians like the Shakas, Kambojas, Yavanas, Tusharas, Parasikas, Hunas etc. by annihilating these sinners completely. The terms "Yona," "Yonaka" or "Yavana" later took on a wider meaning of Mlechchas (Barbarians) and a designation to all foreign tribes or the westerners visiting India. Indian languages did not address the difference based on religion early on, but after the arrival of Islam to the subcontinent, more than Mussalaman or Muslim, appellation Yavana along with Turuka, Turuska, Tajik, and Arab came to be used for invaders professing Islam as their religion. ↑ (Mahawamsa XII): The Converting of other countries., Translated from Pali by Wilhelm Geiger, lakdiva.org. Retrieved December 31, 2008. ↑ (Mahawamsa X) The Consecrating of Pamdukabhaya lakdiva.org. Retrieved December 31, 2008. ↑ (Mahawamsa XXIX)The Beginning of the Great Thupa lakdiva.org. Retrieved December 31, 2008. ↑ The Questions of King Milinda, translated by Thomas William Rhys Davids. Hosted at Sacred Texts.sacred-texts.com. Retrieved January 28, 2009. ↑ Mahabharata Chapter III.188.34-36. The First Council.lakdiva.org. Retrieved January 28, 2009. ↑ See Mahabharata Chapter 1.54-21, 1-54-23, 1-55-2, 1-55-3. ↑ Raychadhury. Political History of Ancient India. (New Delhi: Cosmo, 1996), 3-4. ↑ Gargi-Samhita, Yuga Purana. Paragraph 5. ↑ Gargi-Samhita, Yuga Purana Chapter, No 7. ↑ Mahabharata 12/105/5, Kumbhakonam Ed. ↑ Clive Hart. The Prehistory of Flight. (Berkeley: University of California, 1985. ISBN 9780520052130). ↑ Gargi-Samhita, Yuga Purana Chapter. ↑ See: Mudrarakshas, Act II. ↑ Brahmanda Purana, Upodghata-pada, 16-17. ↑ Padama Purana, Srshtikanda, 47.69-75. Avari, Burjor (2007). India: The ancient past. Routledge. ISBN 0415356164. Banerjee, Gauranga Nath (1961). Hellenism in ancient India. Delhi: Munshi Ram Manohar Lal. OCLC 1837954 ISBN 0836429109. Bhatt, M. Ramakrishna. Brhat Samhita of Varahamihira. (Text in Devanagari with English Translation, Exhaustive Notes and Literary Comments). (reprint) New Delhi: 2003. ISBN 08120810600. Boardman, John (1994). The Diffusion of Classical Art in Antiquity. Princeton, NJ: Princeton University Press. ISBN 0691036802. Bussagli, Mario and Francine Tissot; Béatrice Arnal (1996). L'art du Gandhara. (in French). Paris: Librairie générale française. ISBN 2253130559. Cambon, Pierre (2007). Afghanistan, les trésors retrouvés. (in French). Musée Guimet. ISBN 9782711852185. Chattopadhyaya, S.. The Sakas in India. Santiniketan, Visva Bharati, (1955). 2nd. ed. 1967. Errington, Elizabeth and Joe Cribb; Maggie Claringbull; Ancient India and Iran Trust; Fitzwilliam Museum (1992). The Crossroads of Asia: transformation in image and symbol in the art of ancient Afghanistan and Pakistan. Cambridge: Ancient India and Iran Trust. ISBN 0951839918. Foltz, Richard (2000). Religions of the Silk Road: overland trade and cultural exchange from antiquity to the fifteenth century. New York: St. Martin's Griffin. ISBN 0312233388. Hart, Clive. The Prehistory of Flight. Berkeley: University of California, 1985. ISBN 9780520052130. Keown, Damien (2003). A Dictionary of Buddhism. New York: Oxford University Press. ISBN 0198605609. Law, Dr. Bimala Churn. Indological Studies. 1950. Lowenstein, Tom. The Vision of the Buddha: Buddhism, the path to spiritual enlightenment. London: Duncan Baird. ISBN 1903296919. Marshall, Sir John Hubert (2000). The Buddhist art of Gandhara : the story of the early school, its birth, growth, and decline. New Delhi: Munshiram Manoharlal. ISBN 812150967X. McEvilley, Thomas (2002). The Shape of Ancient Thought. Comparative studies in Greek and Indian Philosophies. Allworth Press and the School of Visual Arts. ISBN 1581152035. Narain, A.K. (2003). The Indo-Greeks. (in English). B.R. Publishing Corporation. "revised and supplemented" from Oxford University Press edition of 1957. Narain, A.K. (1976). The coin types of the Indo-Greeks kings. (in English). Chicago, USA: Ares Publishing. ISBN 0890051097. Parasher-Sen, Aloka (2004). Subordinate and marginal groups in early India. Oxford: Oxford University Press. ISBN 0195665422. Puri, Baij Nath (2000). Buddhism in Central Asia. Delhi: Motilal Banarsidass. ISBN 8120803728. Raychadhury, Hemchandra. Political History of Ancient India. New Delhi: Cosmo, 1996. Rishi, Weer Rajendra. India & Russia: Linguistic & Cultural Affinity. Delhi: Roma Publications, 1982. Rosenfield, John (1967). The Dynastic art of the Kushans. (in English). Berkeley, California: University of California Press. ISBN 8121505799. Shrava, Satya. The Śakas in India. New Delhi, India: Pranava Prakashan, 1981. Senior, R.C. (2006). Indo-Scythian coins and history. Volume IV. (in English). Classical Numismatic Group, Inc. ISBN 0970926863. Tarn, W. W. (1984). The Greeks in Bactria and India. Chicago: Ares. ISBN 0890055246. This page was last modified on 29 July 2013, at 13:47.